We did a quick road trip this weekend to Kah-Nee-Ta and I wanted to test a theory I had. When Laddy and I travel alone, and I turn a corner, all of his books and other paraphernalia slide across the back seat, well out of reach, which then brings on all sorts of fits and crying and me usually looking for a quick place to pull over so I can gather it all back up and slide it over. I was done with that after our trip to California last month. There are a lot of turns in the mountains, and some times it slid back and sometimes it didn’t. It was annoying. Looking around his room I realized his folding Ikea boxes would fit perfectly in our back seat, right next to his chair. I loaded it up with books, his coloring, the TAG reader, snacks, his water bottle, headphones, pretty much everything he needs while we are traveling! I created basically a little travel kit for him. One that was at hand, and wouldn’t slide out of place. This worked so well this weekend, I might put one in the passenger seat for my stuff (when I don’t have someone traveling with me). The beauty of these boxes is when you don’t need them they fold flat and I can store them with my spare tire or under the mattress in the trailer. They come in the blue-green or a red-orange, so they are fun to look at too. One other great thing, is they are see through on one end, so when he is complaining he can’t find something, I can look back quickly and remind him where it s in the box. A $5 solution to our problem! Perfect! 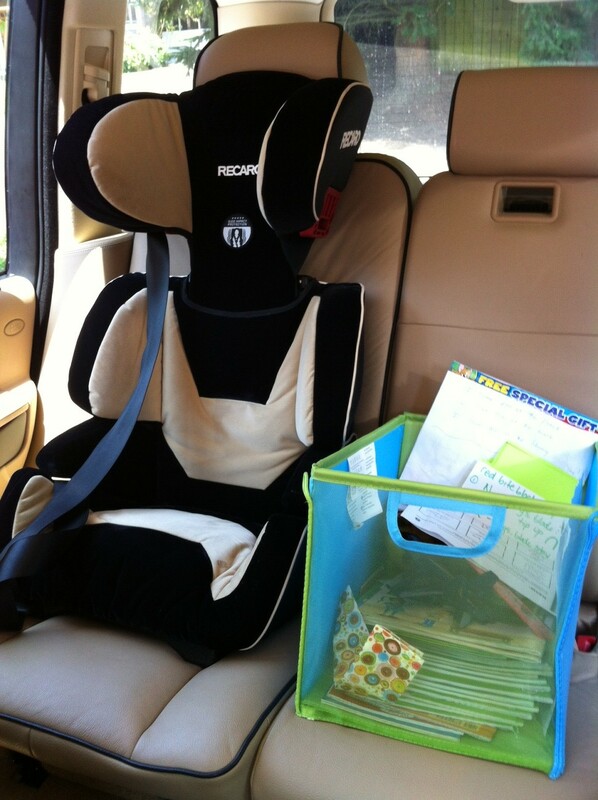 To be honest, we are leaving it in there all of the time now because it keeps the back seat more organized too. For me, messes are crazy making! I am now wondering why I didn’t think of this before, and also…what else haven’t I thought of yet? Ever feel sorta outta place?